32nd MAPS Expo Starts SOON! In honor of the Mid-America Paleontology Society (MAPS) Expo taking place March 26-28, 2010 starting this Friday and it being an Ordovician Period themed show, here is a freshly found conodont. 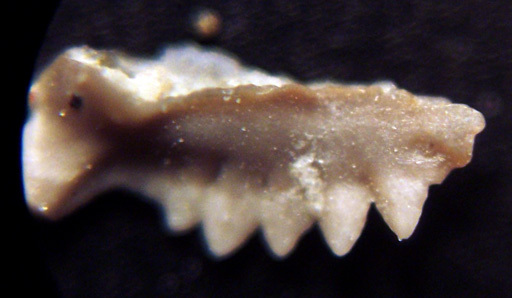 This conodont (magnified 100x) was found in material from Lexington, Kentucky and thanks to Herb for that. As he reminded me, if you have not spent at least 2 hours with your micro material cleaning/decanting then you just have dirty material. Let's talk about MAPS Expo. The expo is being held at the Western Hall, University Drive, Western Illinois University campus. FREE ADMISSION!!! Billed as the "world's largest all-fossils show" with lots and lots of exhibitors and dealers. This year featuring a 33 foot (10 meters) duckbill dinosaur skeleton. Silent auctions throughout the show and a 100 specimen live one at 7:30 PM March 27. Experts will be on hand to help identify visitor fossils. Dr. Robert Frey of Ohio will give the talk The Age of Nautiloids in the American Midwest: The Platteville Fauna in Illinois and Wisconsin on Friday, March 26, 2010 at 7 PM. Don "The Fossil Guy" Johnson will discuss Laura the Hypacrosaurus and Other Duck-billed Dinosaurs on Saturday, March 27, 2010 at 10 AM. MAPS member Bill Desmarais on Saturday, March 27, 2010 at 11 AM will present a program about dinosaur research expeditions in Alberta, Canada. John A Catalani, and Ordovician cephalopod expert whose talk is titled "Life and Times in the Ordovician" presents at 1 PM on Saturday, March 27, 2010. He is a KYANA Geological Society member and I think I may have met him on a field trip. Should be a nice talk. University of Iowa professor Charles Newsom will help visitors with their fossil identification at 2 PM on Saturday, March 27, 2010. Curator of University of Iowa Geoscience Repository will talk about storing, organizing, protecting, and documenting a fossil collection at 3 PM on Saturday, March 27, 2010. WOW, this looks like a great show. So if you can attend this weekend, enjoy the fossils!